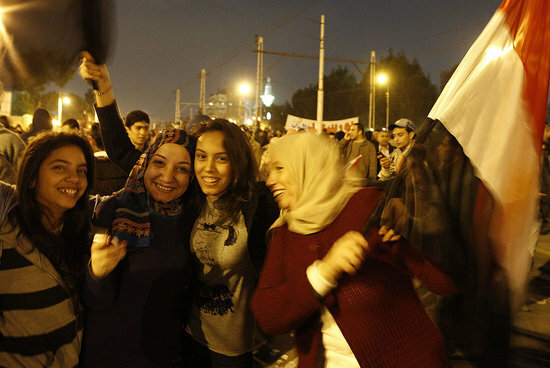 Egyptian women celebrate outside Egypt’s presidential palace after President Hosni Mubarak stepped down a few hours ago. The streets of Cairo exploded in joy when Mubarak finally resigned after 30 years of autocratic rule. and the protests against Hosni Mubarak in Tahrir Square were no different. ‘Ruheya is a 21-year-old university student. She’s come to Tahrir Square from the northern town of Sharqeya — a hundred miles away. Thursday she’s one of the volunteers monitoring the entrance to the Square, checking identification and searching bags to make sure no one brings in weapons. She steps forward eagerly to speak with me, and launches into an attack on President Hosni Mubarak. “There are Christian girls here, there are girls with their hair uncovered,” Ruheya said. “We’re all volunteers. We’re all Egyptians, whether we’re Christians or Muslims, whether we’re religious or not, we’re all good people. Ruheya wears a long, conservative veil. She’s been involved in protests on her university campus led by Islamist groups. But she’s never participated in something like this. And, she said, it’s bigger than any religious or political affiliation. Many of those “sacrificing” are women, which may come as a surprise to many but really shouldn’t, said history professor Mona Russel. “Women were at the forefront of the 1919 revolution in Egypt right before Egypt got its independence, in the struggle against the British; women were prominent at the time of the French occupation as well,” Ruheya said. But because of the scope and significance of the last few weeks, women felt they could get involved. Asmaa’ Mahfouz is a young activist who posted YouTube videos of herself calling on Egyptians to participate. Khuloud Saber is a human rights activist. She’s been going to the protests every day since they started. I met her in the busy offices of the non-governmental organization where she works. This is behavior that in normal times might have attracted unwanted attention or criticism. Nowadays, Saber said, nobody even notices. This story was originally covered by PRI’s The World. PRI’s “The World” is a one-hour, weekday radio news magazine offering a mix of news, features, interviews, and music from around the globe. “The World” is a co-production of the BBC World Service, PRI and WGBH Boston. More about The World.